Sonar PR Precision Release Aquatic Herbicide provides a fast, predictable release of active ingredient in a convenient and economical formulation for the precise management of aquatic vegetation in fresh water ponds, lakes, reservoirs, potable water sources, drainage canals, irrigation canals and rivers. While each Sonar formulation provides applicators an abundance of options when seeking to control nuisance aquatic vegetation in a variety of treatment situations, Sonar PR Precision Release brings improved efficacy, broader treatment sites and increased monitoring capability to the ever-expanding Sonar product line. 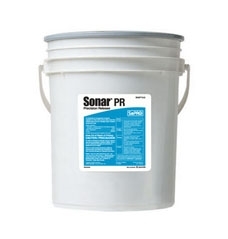 Sonar PR Precision Release delivers a higher initial active ingredient concentration than Sonar SRP while maintaining a higher concentration for a longer period of time after the initial application than both Sonar A.S. and SRP. This combination provides improved efficacy in an even wider variety of challenging situations such as aquatic situations with dilution, flow or more tolerant target plants. With Sonar PR Precision Release, more active ingredient is available throughout the treatment period, improving treatment monitoring options and increasing control of more tolerant plants. Finally, with the increased release rate of Sonar PR Precision Release from the bottom of the water column where it is already less susceptible to photodegredation, a maximum amount of active ingredient is available for absorption by the target plants. Sonar Aquatic Herbicide selectivity is dependent upon dosage, time of year, stage of growth, method of application and water movement. Please see the Sonar label for an outline of vascular aquatic plants controlled, partially controlled and not controlled by Sonar. Algae (chara, nitella, filamentous species) are not controlled by Sonar.